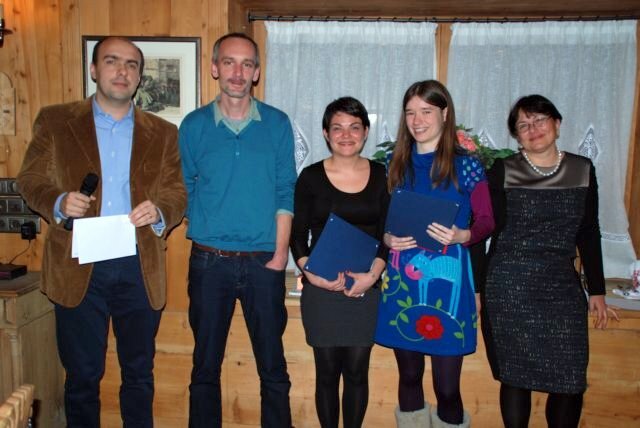 Two NJC poster prizes were awarded during the European-Winter School on Physical Organic Chemistry, which was held in Bressanone (Italy) from 27 January to 1 February 2013. Giulia Iadevaia, who graduated in chemistry from the University La Sapienza in Rome and completed her Masters thesis under the supervision of Prof. Antonella Dalla Cort. During this time, she collaborated with Prof. Giulia Licini (University of Padova) and Prof. Kari Rissanen (University of Jyväskylä), where she carried out part of the work. Giulia is currently undertaking a PhD under the supervision of Prof. Christopher Hunter (University of Sheffield), studying cooperative hydrogen bonded systems. Her current research interest is in supramolecular chemistry, molecular recognition, and host-guest complexes. Matea Vlatković was educated at the University of Zagreb. For her master research project, she moved to the University of Warsaw to work on constitutionally dynamic anion receptors with Dr. Michał Chmielewski. Matea is currently a PhD student under the supervision of Prof. Ben Feringa at the University of Groningen. Her main research interests include organic synthesis, molecular switches, supramolecular chemistry, and catalysis. Besides her research activity, Matea enjoys dancing salsa, reading, traveling, and hiking. From left to right: Christiano Zonta, Laurent Vial, Giulia Iadevaia, Matea Vlatković, and Giulia Licini.